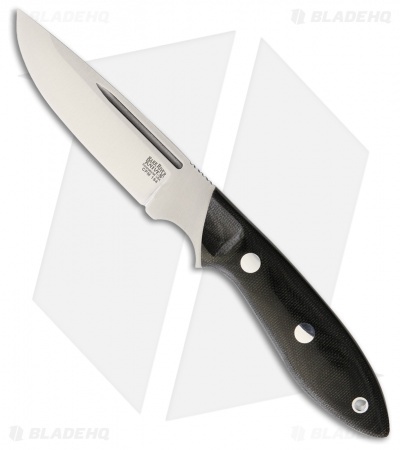 The Bark River Adverturer III is a full sized fixed blade knife ready for any camp or hunting chore. Crucible CPM-154 stainless steel is the perfect combination of tough, corrosion resistant and edge retention for a outdoor fixed blade knife. Black canvas micarta scales are palm filling for a secure and comfortable grip. Weighing 6 ounces, the knife is lightweight in hand or in the included hand made leather belt sheath. Sturdy CPM-154 stainless steel blade will tackle any camping/hiking chores.